Yesterday while at work I stumbled upon VH1.com. There are previewing the Curiious George Soundtrack. 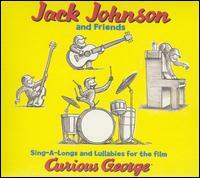 It is all new songs by Jack Johnson. I am a big Jack Johnson fan so I checked it out and loved it. It is a wonderful, mellow CD. It has a White Stripes Cover of the song from the opening credits of Napoleon Dynomite. A great song about sharing and about recycling. After lunch Phi and listened to a few songs. I even caught her rocking out. (She rocks back and forth and bobs her head!) I was so excited about getting her a copy of the CD that last night at Target I was so disappointed when they didnt have it. Turns out the CD doesn't even come out until next Tuesday. This is going to be a great bedtime CD for Phi and I can't wait to get it for her. Until then we can only listen to it on the internet.